Forcing elephants to perform in circuses and other entertainment venues has been relegated to a bygone era under legislation originated by students of Pace University’s Dyson College of Arts and Sciences Environmental Clinic and signed into law by New York State Governor Andrew Cuomo. The Elephant Protection Act, sponsored by state Senator Terrence Murphy and Assemblywoman Amy Paulin, makes New York State the first in the nation to implement an outright ban on the use of elephants in entertainment. Pace students first brought the idea for the bill to the legislature in 2016 and spent the next two legislative sessions lobbying for its passage. The Clinic is co-taught by Michelle D. Land, Pace clinical professor of environmental law and policy, and John Cronin, senior fellow in the Dyson College Institute for Sustainability and the Environment. 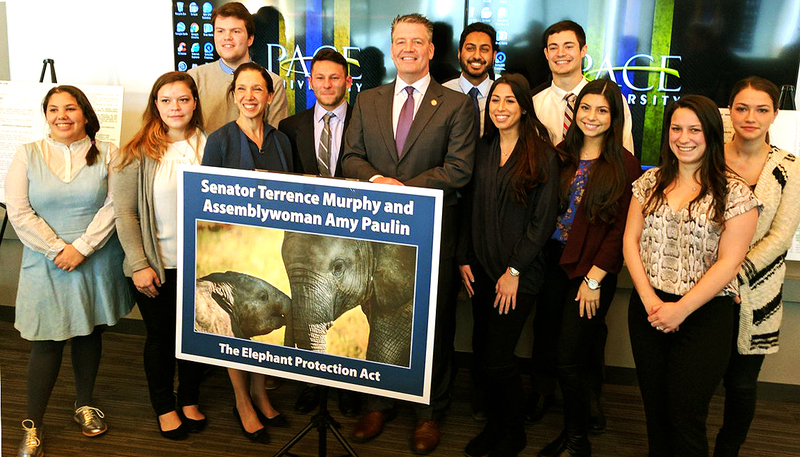 Clinic students join Assemblywoman Amy Paulin and Senator Terrence Murphy to announce the re-introduction of the Elephant Protection Act, February 2017. “Once again, New York State is proving to be a voice for those who cannot speak for themselves.” ~ New York State Senator Terrence Murphy. The training of elephants to perform tricks for audiences has come under fire for years, even forcing the Ringling Bros and Barnum & Bailey Circus out of business. New York State law now recognizes that ordinary animal welfare laws cannot protect elephants from an industry whose practices are inherently cruel. 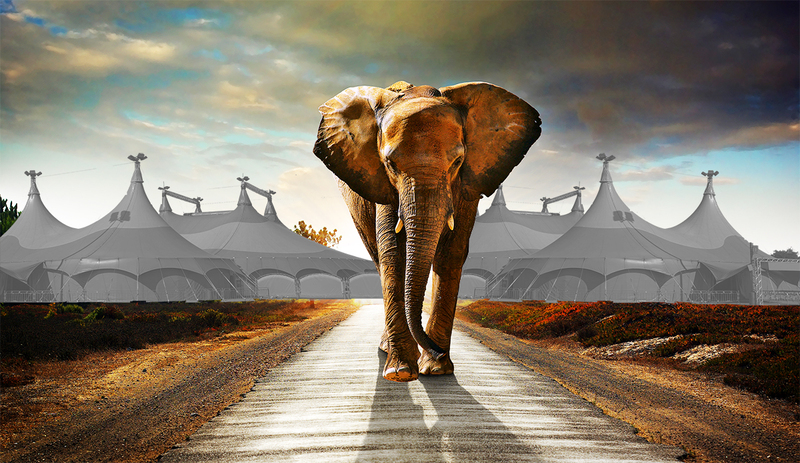 At present, as many as nine circuses bring elephants through New York State annually. Clinic students strategize with Matt Slater, Senator Murphy’s chief of staff, at the head of the table, and, to his left, Morgan J. Maragliano, Senator Murphy’s legislative director. This is such a heartening story–young people taking action, changing the world and making it better one bill at a time. Thanks all for your hard work!